Nobody respected a song more than Kent Finlay. The first time I met him was in 1999. 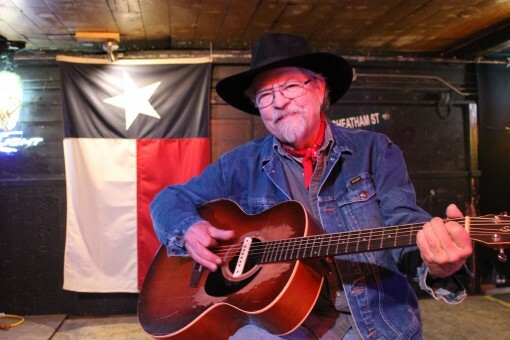 He’d just recently reopened his famed Cheatham Street Warehouse and was in the process of reaffirming the atmosphere and dynamics that he’d fostered for so many years. Weekly songwriter nights were a blend of professional and amateur. But, each lyric, note and artist received the same bent ear from Kent. He didn’t care who you were or what you were about as long as you respected the song. It was always for the sake of the song. He’d nearly driven himself bankrupt for the sake of the song. It was all that mattered. Watching Kent reign over CSW as a young college student first immersing myself in Texas Music on a large scale made a deep impression on me. Being quiet at a concert had never occurred to me until Kent tutored us by example on how to be reverent during a songwriter round. Through my expanding prism of Finlay proximity, I was able to watch Kent tutor a slew of young singer/songwriters. Guys and gals my age. Randy Rogers, Mark Sanders, Ryan Turner, Brandon Wayne Jones, Micah Harris, Angie McClure and many others from this time period come to mind. We all knew his George Strait resume, but not because he told us about it. We were witnessing how he worked first hand. It was a magical time. Kent always made people feel that way though. Closing out each songwriter night with a stirring rendition of his “They Call It the Hill Country” made an indelible impact each time it happened. A gifted writer in his own right, Kent sought to share his knowledge and wisdom with each writer he came across. He provided ideas, advice, money, food, and even a couch or two along the way. Fostering the music of George Strait, Stevie Ray Vaughan, Todd Snider, Hal Ketchum, Monte Montgomery and so, so many others. It’s just what he did. A simple man with a dynamic vision. A true artist and Texas poet. Artists coming up today won’t have the privilege and honor to learn from Kent directly. However, I predict his influence will only grow greater with time. Kent was a mentor, friend and sounding board for some of the best musicians to ever spring from this state. Cheatham Street Warehouse may still stand, but its foundation is forever changed. The spirit of Kent Finlay will endure in perpetuity. And for that we should all be thankful. What Kent built and influenced is far beyond his greatest imagination. They call it the Hill Country and we should all be grateful that he called it home. There’s a hole in the heart of Texas (and Texas Music) now. RIP Kent Finlay. Hello, everyone. It is with great sadness that I announce the passing of my father, Kent Finlay, in the early morning Monday, March 2 (Texas Independence Day). Dad was surrounded by family and friends telling stories and swapping songs when he passed. During his life, Finlay made no bones. His beloved Cheatham Street Warehouse has always existed for creation. Songs begin on Cheatham’s stage. They grow. Breathe. Live. Earn more miles. Finally, they mature into shape. Finlay’s songwriters night, an open mike for original songs he hosted for nearly every Wednesday night at the venue for more than forty years, nurtured singular songwriters and storytellers with stunning frequency during his lifetime. By that year, Finlay was already well seasoned at giving breaks. After all, he’d already helped launch legendary blues guitarist Stevie Ray Vaughan, incendiary punk rockers The Skunks and several dozen other familiar names including country music icon George Strait, who played his first show with the Ace in the Hole Band at Cheatham Street on October 13, 1975. In fact, Finlay effectively changed modern country music history – all music history, frankly – the day he drove the King of Broken Hearts to Nashville to record his very first demo tapes shortly thereafter. Literally bucketsful more – including celebrated guitarists Eric Johnston and Monte Montgomery, deep-browed songwriters Adam Carroll and Walt Wilkins, fiery live acts Joe King Carrasco and Charlie and Will Sexton – have emerged from his humble honky tonk stage. Additionally, legendary singer-songwriters such as Marcia Ball, Guy Clark, Ray Wylie Hubbard, Willie Nelson, Billy Joe Shaver, Ernest Tubb, Townes Van Zandt and dozens upon dozens more regularly stepped on the Cheatham stage throughout the 1970s Cosmic Cowboy heyday. In the end, Finlay maintained a singular focus his entire life. He wrote songs. Discovered and mentored promising songwriters. Created art every way possible. Kent Finlay constantly rose his thoughts through clouds. Fittingly, a swift glance across his business card immediately showed the hand held behind his eyes. The words simply read: Kent Finlay, Dreamer. Very nice. Very deserving. Kent did as much, or more, for central Texas musicians than anyone before, and dare I say after him. God rest your soul Kent Finlay. God rest your soul. Nice tribute to a shining beacon in the skies of the TX Music scene. Kent’s presence will be missed, but his spirit will live on in all who were fortunate enough to know his influence. in google. I know that writing posts takes a lot of time, but you can always help yourself with miftolo’s tools which will shorten the time of creating an article to a couple of seconds. Good day! This post could not be written any better!Reading this post reminds me of my previous room mate!He always kept talking about this. I will forward this page to him.Fairly certain he will have a good read. Thank you forsharing! I just want to say I am new to blogging and definitely liked your website. Most likely I’m likely to bookmark your site . You definitely come with fantastic stories. Regards for revealing your web site. Somebody essentially assist to make seriously articles I might state. That is the first time I frequented your web page and so far? I surprised with the analysis you made to make this actual put up amazing. Fantastic task! certainly like your website but you have to check the spelling on quite a few of your posts. Many of them are rife with spelling problems and I to find it very troublesome to tell the reality then again I¡¦ll definitely come back again. I wanted to visit and allow you to know how great I liked discovering your web blog today. I’d consider it the honor to operate at my place of work and be able to operate on the tips discussed on your website and also be involved in visitors’ responses like this. Should a position connected with guest article author become on offer at your end, make sure you let me know.